Do you ever have those days where you’re just going nonstop? When I finally do get a few minutes to breathe and realize I need food, I’m always craving something comforting. And when you’re under the weather, you tend to want the same thing. 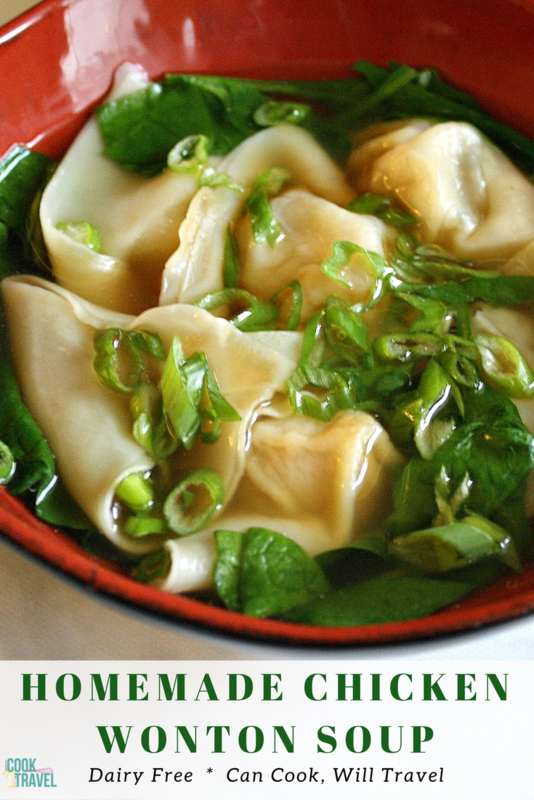 A bowl that calms your mind and heals your soul a bit, and this Wonton Soup is just the thing. It’s really amazing when you think about it, that food has the ability to change our moods or distract us. Anytime I’m stressed or need a break from my laptop (which I always seem to be staring at), I head to the kitchen pronto. Cooking is the best way to distract my mind and help me shift gears. There’s something that I love about being methodical in following a recipe, stirring (I really love to stir! ), and tasting the food and playing with seasoning. I know that all of that can be a bit overwhelming to some and doesn’t feel relaxing at all. But if you you take it step by step and realize that you’re making something to nourish your body and mind, it’s pretty cool. And does much else comfort you like a big bowl of soup like this Wonton Soup? I especially love a good, broth-filled soup, because the flavors are subtle and lovely. One thing I enjoy is that when I eat soup, I slow down, pay attention to all of the flavors and textures, and become a bit more present in that moment. Thanks for that, soup! 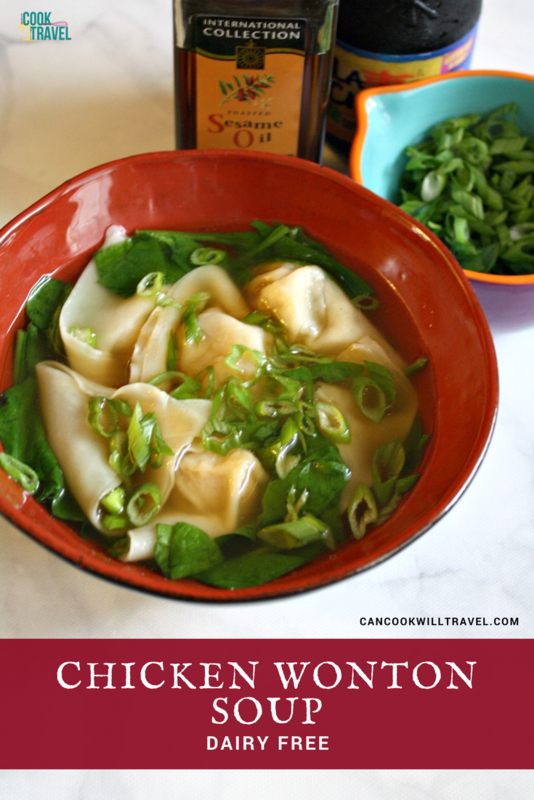 What’s great with this wonton soup is that it’s a simple chicken soup with the chicken hidden in the wontons. And I can definitely see myself making this recipe anytime I’m feeling sick or just want to slow down a bit. These homemade wontons are great, too. Just combine ground chicken with minced ginger, a little salt and pepper, soy sauce, toasted sesame oil, and scallions (or whatever garlic or onion flavor you’d prefer). Then place a little chicken in the center of your wonton wrapper and form your wonton shapes. Once I did my first 2 or 3, I had the process down pat and whipped up a whole batch of them in no time. You can use all of these wontons for the soup, but since I was getting ready to head out of town I didn’t do that. I opted to reserve a few for the soup, and then froze the rest. The wontons on their own are really good, so I didn’t want to lock myself into only using them for soup. I have a feeling I’ll be playing around with different ways to eat them in the upcoming weeks. When it comes to the broth, you can keep it simple and use a pre-made broth or stock. Or, much like I did for the Chicken Ramen Soup I made, you can amp up the flavor. I did that by adding some ginger, garlic, scallions, and a little soy sauce and simmered that in the broth for about 20-30 minutes. Then remove the veggies and add in a little baby spinach then toss in some cooked wontons, and you’re done! For topping the soup, just add a nice amount of chopped scallions along with a little drizzle of soy sauce and toasted sesame oil. Just smelling this soup caused me to take a deep breath and subconsciously chill out a bit. My to do list the day I was making this soup was rather lengthy, but this wonton soup cleared my mind for just a moment and let me forget about all of the tasks on my plate. It also reminded me that I hurry through my meals every day way too much. Often I’m working, watching TV, and thinking about 10 things at once, and I don’t shut off my brain. So I’m going to make an effort at meal time (no matter what), to take 10 minutes and just stop. Turn off the TV and laptop, shut off the music, silence my thoughts, and be present and enjoy my meal. Who knew that this Wonton Soup would have me getting a bit philosophical, but it certainly did! 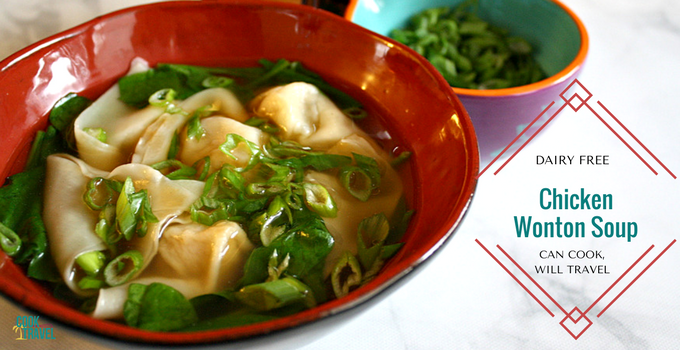 So when you have an hour and want some comfort food, try your hand at this wonton soup. Have fun creating your own wontons, and soon they’ll be floating in a lovely chicken soup that’ll soothe your soul. Click that link for the recipe and step by step instructions. Happy wonton making! One year ago: Churro Donuts – Yes, These Exist! Two years ago: Balsamic, Honey Roasted Cabbage Steaks . . . Cabbage Lovers, You’re Welcome! Three years ago: Pancakes for Everyone! Banana Nut Bread Pancakes! Four years ago: Woohoo it’s Easter, which Means Chocolate Peanut Butter Eggs Season! Five years ago: Roasting Red Peppers . . . Easy and Delicious! Six years ago: Scones Galore!